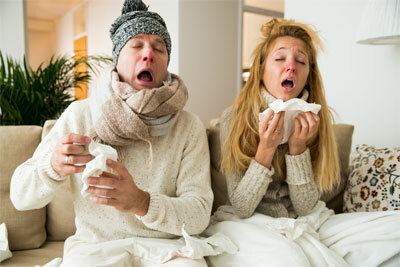 Did you know that Americans catch one billion colds each year? You’ve no doubt had a bout with a cold in the last couple of years, if not this year. And you’ve thought it more than once. While you are sneezing, coughing and blowing your nose from a bad cold you’ve said to yourself “If we can land a man on the moon why can’t we cure the common cold?” Good question. Part of the answer to why we can’t cure the common cold is that it is caused by many different viruses, most of them rhinoviruses which means “viruses in the nose.” These viruses can also trigger asthma attacks, sinus and ear infections. We catch colds from other infected people by touching surfaces that they’ve touched or breathing in air into which they’ve sneezed or coughed. Being cold or wet doesn’t bring on a cold; however, fatigue, stress, allergies, and contact with those who are sick sure can. Other viruses that can cause colds include respiratory syncytial virus, human parainfluenza viruses, and human metapneumovirus. It’s a bit of a viral soup when it comes to the common cold, and each of them has their very own unique way of making you sick. Respiratory syncytial virus: RSV is a respiratory virus that infects the lungs and breathing passages. Healthy people usually experience mild, cold-like symptoms and recover in a week or two. However, RSV can be serious for infants and older adults but usually infects children before their 2nd birthday. The symptoms typically last 1-2 weeks in younger children and tend to be less severe in adults with a shorter duration of symptoms. It’s quite contagious but typically amounts to just a cold. RSV is the most common cause of bronchiolitis and pneumonia in children less than 1 year of age. Symptoms include fever, breathing difficulty, coughing up of yellow/green/grey mucous, dehydration, and refusal to breast- or bottlefeed. According to the CDC, when infants and children are exposed to RSV for the first time, , 25 to 40 out of 100 of them have signs or symptoms of bronchiolitis or pneumonia, and 5 to 20 out of 1,000 will require hospitalization. Most children hospitalized for RSV infection are younger than 6 months of age. Infants and children infected with RSV usually show symptoms within 4 to 6 days of infection. Most will recover in 1 to 2 weeks. However, even after recovery, very young infants and children with weakened immune systems can continue to spread the virus for 1 to 3 weeks. Human parainfluenza viruses: HMPV is in the same family as RSV and causes respiratory infections typically in children under the age of 5 but can also affect older people and those with weakened immune systems. Symptoms include cough, fever, nasal congestion, and shortness of breath. Like a cold, it is spread through contact, coughing, and sneezing. Human metapneumovirus: HPIVs commonly cause respiratory illnesses in infants, young children, older people, and those with weakened immune systems. HPIV-1/HPIV-2 symptoms are croup, fever, cough, and runny nose. HPIV-3 symptoms include bronchitis, bronchiolitis, and pneumonia. Now you see why it is so difficult to cure a condition that has many different causes. As mentioned, the virus can be picked up virtually anywhere. Cold viruses can spread from infected people to others through the air and close personal contact, through handshakes and contact with door knobs, keyboards and phones. Parents can get infected while changing a child’s diapers. Anyone can get the cold virus through contact with respiratory secretions from an infected person. For example, if someone sneezes into his or her hand and then shakes hands with you, the cold virus is on your hand. If you then touch your eyes, nose or mouth, the virus has an open doorway into your body. Cold viruses love to live on surfaces that have not been cleaned, so you can pick it up on anything you touch. That is why the CDC and numerous other health organizations say that washing your hands frequently and properly is the best way to stop the spread of disease and infection, including the common cold. How do you wash your hands properly? What is the best way to treat the common cold? You should get lots of rest and drink plenty of fluids. Over-the-counter medicines may help ease symptoms like a cough, runny nose and sore throat but they won’t actually make the cold go away faster. It will resolve itself with time. Antibiotics will not treat your cold because they do not fight viruses. If you have chronic cold symptoms, it may be chronic sinusitis or another condition of the ear, nose or throat. We can help to relieve the pain and pressure and can treat chronic post nasal drip. Consult with one of our board certified physicians to find relief.